Ready to change the boring picture that Windows 10 automatically assigns to your user account? For every newly created user account, Windows chooses a generic silhouette. Feel free to change the picture to something more reflective of the Real You: You can snap a photo with your computer’s webcam or choose any photo in your Pictures folder. To change your user account’s picture, head for the Start menu and click your picture in the screen’s top-right corner. When the menu drops down, choose Change Account Settings. Windows presents the screen shown here. 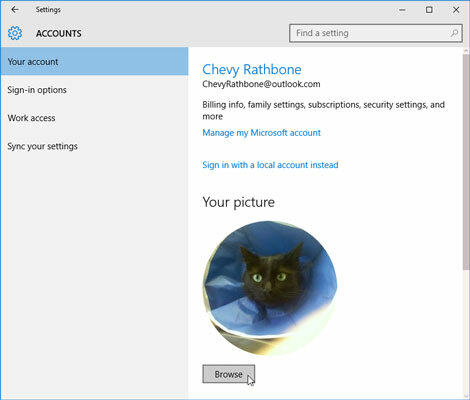 Windows lets each user choose an account picture. Browse: To assign a picture already on your computer, click the Browse button. A new window appears, showing photos in your Pictures folder. Click a desired picture and click the Choose Image button. Windows quickly slaps that picture atop your Start menu. Camera: This option, available only for people with a camera attached to their computers, lets you take a quick selfie for your account photo. Other Accounts You Use: Choose this option to grab your account photo from social media accounts you’ve shared with Windows 10. After you’ve chosen an account photo, it attaches to your Microsoft account and anything you sign in to with that account: Your Microsoft phone, for example, Microsoft websites and programs, and any Windows computer you sign in to with your Microsoft account.